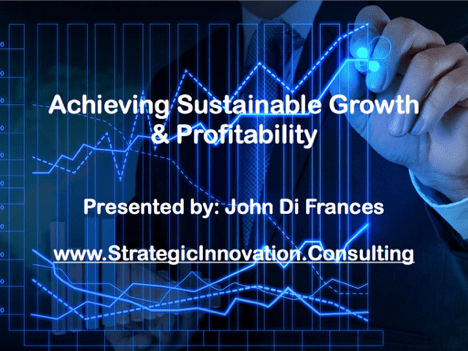 Last week, I was the keynote speaker for a business association on the theme of Achieving Sustainable Growth & Profitability, the subject and title of my latest book. I began by illustrating the fact that we are living in a time of unprecedented ‘disruption’ in virtually every aspect of our lives, both personal and business and that this disruption will continue to increase in pace and scope. Even our upcoming presidential election has been marked by disruption as never before. Forget for a moment the politics and partisanship involved and just focus on the disruption occurring. Donald Trump has continued his life long practice of gaining massive free media instead of paying for multimillion dollar ad buys in each major media market as his opponent is doing. Meanwhile there has been the hacking of Clinton’s emails and the DNC computers, the entry of Wiki Leaks into the fray threatening additional pre-election disclosures possibly further damaging Clinton and even accusations of Russian involvement in our federal and state election processes. What comes next is anyone’s guess, but without doubt, it will continue to be characterized by unprecedented DISRUPTION! The mainstream media, even apart from Trump’s politics, is chagrined by him and well they should be, as he is disrupting their future. Every form of media, whether print, broadcast or web has one common goal, that is to sell advertising, without which they will cease to exist. Trump is showing not only other politicians, but businesses that they can garner massive ‘free’ media coverage. And not only free, but more effective media coverage than paid advertising. Studies have shown that non-advertising media coverage is listened to and believed far more than paid ads. Now trump is by no means the first to realize and exploit this fact. In 1980, Nicholas Graham began Joe Boxer with an investment of $1,000. Bragging that he never paid a single $1 for advertising, he built the brand of graphically colorful men’s underwear into a $100,000,000 business through media stunts in major metropolitan centers and university campuses. Smart companies are learning from the Trump media campaign and will be seeking to employ creative strategies to gain free media coverage at the expense of the media. Today, even negative media, if carefully managed and countered can have highly positive impacts. Last year’s protests against Chick-Fil-Lay, which protestors intended to hurt the company’s sales, boomeranged as the company’s supporters responded by frequenting its restaurants more often, thereby boosting sales revenue and profits. The feedback from the attendees to my keynote was very positive, although, I think I really scared a lot of them. Good! That was the first part of my goal. They need to be scared! Now they need to ACT!, which was the second part of my goal. If they do, they can become the disrupting force in their marketplace. If they don’t, it is only a matter of time until they are disrupted out of business.